Yesterday’s blog post in my Regency Servants series focused on the valet and lady’s maid. Amongst the numerous duties they performed, cleanliness of the gentleman and lady whom they served topped the list. With this in mind, I will be posting this week on various hygiene-related topics. To begin, let’s discuss bathing history and habits during the Georgian period. We have all heard the claims of how filthy and smelly everyone was in the past due to the FACT that bathing was practically an unheard of concept or universally thought to be fraught with deathly peril. While true that many people did not have daily access to a water source in pre-plumbing eras and hygiene products were not plentiful at the corner market, the so-called “facts” of bathing habits are wildly erroneous. Why? Glad you asked! In large part, we can thank H.L. Mencken. What is the truth? Glad you asked! Like many topics in history, in a short essay summing up is the best that can be done. This essay will focus on bathing practices immediately before and during the Georgian age, but I will touch lightly upon previous eras and cultures. At the end I will include additional references for further reading. Even if you slept through your years of elementary and high school history, I am sure you recall the ingenuity and magnificence of the Roman baths, the sweat houses of the American Indians, and the steam rooms of the ancient Greeks. These and many other examples prove that humans in a wide range of cultures strived for cleanliness. Despite some of our pre-conceived notions of how filthy and stinky everyone was up until the days of inside showers, the truth is somewhat different. In other words, the awareness of being clean is not a 20th-century phenomenon. That said, the concepts and methods of staying clean varied widely and changed dramatically over the decades for a host of reasons. Even those historians who seriously research this topic have divergent opinions. It is vital to remember the tendency to generalize whole cultures or classes of people, often arriving at conclusions with scant information. Adding to the puzzle for this topic, it is common for people to jot down the important events happening in the world and in their lives, but very few record how they bathed or brushed their teeth. The aptly named Dark Ages saw the destruction of written materials with little new documentation created, so those centuries are steeped in mystery and first-hand writings are contradictory. What does seem to be fairly clear is that Europe of this time had diverged greatly from the Roman and Oriental influence in regards to bathing. The two main reasons for this dearth in proper hygiene were, 1) the involvement of the Church, and 2) a primitive concept of infectious disease. The Church became outspoken regarding the supposed sin and self-indulgence that surrounded the public bathhouses of the day. At the same time, people began to identify a connection between the epidemics and diseases that were rapidly spread through poorly maintained and constructed lead viaducts and contaminated water supplies. There was truth in both points. The paintings below are two examples depicting bathhouse scenes, the one to the left clearly a brothel/bathhouse combo. (Google “bathhouse Pompeii” images for seriously shocking frescos on the walls of the ruins! Baths of Sergius Orata from Book IX of Facta et dicta memorabilia (Memorable Deeds and Sayings) by 1st-century Roman author, Valerius Maximus. 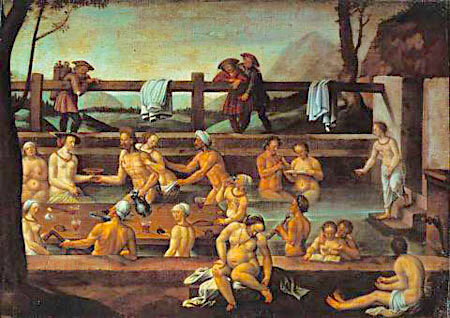 The Church pushed the idea that bathing was a form of vanity leading to immorality and sexual sin. Visible dirt and odor were considered a sign that one’s focus was on God and family. It was also believed to be a protection from plaques, protecting the skin from unsanitary waters. Strangely and unbelievably enough, the smell was not off-putting, especially when hid under layers of clothing and perfumes. Quite frankly, their olfactory nerves were probably deadened or extremely tough. As an aside, perfumes during those decades were not to mask your own odor but to smell something pleasant rather than the stench emanating from the fella next to you. Napoleon’s bathtub at Palazzo Pitti in Florence. Naturally, there were exceptions to this pervading attitude. The centuries of cleanliness were not all that easy to eradicate and many people continued to wash and bath as often as was possible. Queen Elizabeth I was known for her adherence to bathing, adding the first indoor bathroom to Windsor Castle. The business of making soap in England was so financially solvent that King James I, in 1622, granted a massive monopoly to a soap maker so he could reap the monetary benefits. In the 1660s Samuel Pepys wrote in a diary entry that his wife was “busy in going with her woman to a hot-house to bathe herself.” A little later in the same entry, he lamented that in the evening she insisted he “clean himself with warm water” before she’d let him come to bed! Smart woman. Napoleon Bonaparte was fanatical about bathing, to the point that a tub of hot water was constantly kept near him so he could submerge whenever the fancy struck. The Regency Era Duke of Wellington took a daily bath and was considered odd for doing so, but the practice was emulated by others. The mid-1700s onward spawned a revival in the concept of cleanliness with ancient Roman bath towns, like Bath, being revitalized and their buried secrets revealed. Seaside towns like Brighton and Weymouth launched a massive tourist trade that would not only affect bathing, but also travel aspects like improved road conditions, overnight accommodations, and public transportation. The glamour of such places was the socialization, but gradually the joy of just being clean did catch on. Celebrities of the day, such as John Nash, the Prince Regent, and Lord Admiral Nelson (to name a few) lavishly extol the virtues to be had in the waters and how robust their health as a result. “My health, thank God, is very near perfectly restored, and I have very near the perfect use of my limbs, except my left arm.” Wrote Nelson after a visit to Bath to recuperate from battle wounds. A great portion of the thanks goes to wise men often thought of as quacks who extolled the virtues of sea bathing and “taking the waters” at the rapidly increasing number of mineral spas. These men preceded those who would finally identify bacteria and viruses, but they instinctively and, in some cases, through scientific observation and research recognized the hidden horrors in filth. The continued incidence of diseases and plagues in spite of avoiding unclean water led to the inevitable questions leading to a multitude of amazing scientific discoveries and changes in practice. Precisely how wide-spread the practice of frequent bathing at home is very difficult to ascertain and there is strong verification for both sides of the argument. What is indisputable is that our modern practice of bathing as a daily occurrence with full immersion, shampooing, etc. was simply not the case until well into the 20th century. Reasons: Water sources were irregular and not always fresh; the average person did not have the time to heat bucketfuls of water or lug cold ones to fill a large bathtub; soaps, tubs, and other bathing adjuncts were costly; plumbing was in its infancy; and centuries of traditions, superstitions, false information, and plain old-fashioned ignorance were slow to fade. The sad truth, no matter how hard we may wish to paint it pristine in our Merchant/Ivory idea of England, is that not everyone was lily-white and smelling sweet. Does that mean Mr. Mencken was correct? Not at all! Lengthy tub baths are not the only way to stay clean, for one thing. And the truth is, humans do not need to bathe every day under normal circumstances. Of greater significance, Europe was inching closer to the Industrial Revolution when the tide of logic swept old ideas away and technology improved the way of life. 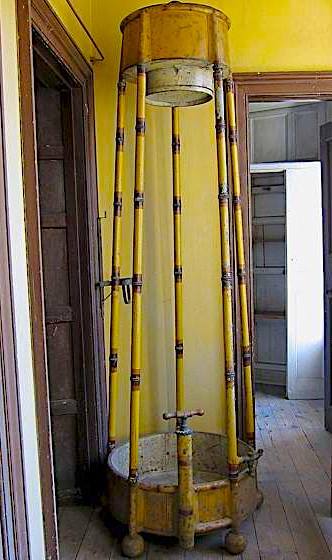 In 1810, the English Regency Shower was invented, described as a 12-foot high tote shower made of metal painted to look like bamboo, consisting of a basin with a drain and hidden tank, with a pump arrangement to force the water to the top basin and then out the hollow poles onto the bather’s head. There were hinges along the top for the curtain. The user, who wore an oiled cap to protect their hair, was as likely to be a man as a woman. Probably not a popular a device and certainly only purchased and used by the wealthy dandy of the day, but the fact that it even existed at all gives credence to the idea that cleanliness was not quite the horrific ideal that some maintain was the standard. The bathtub has been around forever, the construction of large basins to put quantities of water in for washing steeped in antiquity. The sizes ranged from the enormous structures utilized for public bathhouses, to modest baths in homes with a natural spring source, to tubs for full immersion of the body, down to small “hip baths” and basins. Construction materials included marble, wood, metals, and porcelain. Basins placed onto washstands for the cleansing of hands and face were a standard fixture in every home no matter the occupants’ attitude on total immersion bathing. Portable tubs were most common as plumbing, once a refined technology for the Greeks and Romans, was not widely available and perfected until the end of the 18th century. The slideshow below has examples of bathtubs, hip baths, and bidets. The history of pipes, pumps, and plumbing is vast — I will touch on the topic in a post later this week — but be assured that the ability to access and distribute water from a distant source was a long-established technical skill. Piping into a house, even above the first floor, was technologically possible but rare beyond the kitchen. The evidence of this expertise is seen in the grand fountains of the day. Therefore, it was not fantastical or impossible for the luxury of piped and even heated water if one was wealthy and forward-thinking. However, it would be well into the Victorian Era before fancy claw-foot tubs with hot and cold running water in elaborately decorated bathrooms became the norm. It is also necessary to note that even today it is a primarily western cultural normalcy to bathe or shower every day, the bulk of the world still not doing so. Ironically, even in the modern west showers are far more common. Baths have been relegated to the once-in-awhile event done for the joy of relaxing rather than for cleansing. In a sense, bathing has come full circle to once again be a rarity! 4 Comments for Were our Ancestors Greasy Grimy or Squeaky Clean? A Brief History of Bathing. Thank you for such an interesting article with so much picture evidence of bathing through the ages and especially in the Regency era. I love the showers. As with so many things Regency, they look familiar, as if they are just old fashioned, rather than from a by-gone age. My studies included medieval French texts and from those we know it was the custom to set a huge cauldron of water over a fire, so that people could take a bath and the water would stay hot for as long as you wanted to soak. Of course there was a story of a man being boiled to death by a vengeful enemy. All over the Ottoman empire, high officials would build bath houses for the benefit of the local people. You can see a couple from the 1500s in Budapest, for example. Europeans must have been aware of these, maybe enjoyed the incredible cleansing scrub, which keeps your skin clean for ten days afterwards. Returning to the bits that ordinary folk washed, if you click on this link [ Hampshire Heritage Collection ] you can find Gilbert White’s House [it’s not far from Jane Austen’s house at Chawton. There is a picture of his bedroom, and by the four poster bed is a small wooden stand, with his wash basin on it. I was horrified because it’s no bigger than my cereal bowl. This is very interesting, Sharon. My own researches indicate that bathing, at least in England, fell out of popularity in the late 18th century, partly because of a growing sense of prudery, until the early 19th century when Beau Brummell declared that for a gentleman to be properly dressed in society he must first be scrupulously scrubbed clean. This also led to more-frequent changing of undergarments, including men’s shirts, which were considered undergarments. In any case, I’ll continue to enjoy Darcy’s bath scene in P&P-1995! Many thanks for posting. Thank goodness I don’t have to rely on one of those hip baths as I’m not sure my hip would fit and certainly they wouldn’t both go in!!! Luckily my shower is a little more modern than the ones pictured – another perk of living in this century rather than the nineteenth! Apart from anything else, having no servants it would be left for me to carry the buckets of water. Saying that, until I was nearly five the house we lived in had no bathroom. We had an outside toilet and a tin bath that my Mum had to fill from a boiler. I was first then my two older brothers. We then moved to a house with a bathroom – such luxury! Thanks for this post Sharon, I look forward to more.